Beautifully converted 150-year-old farmhouse with the aim of maintaining the rustic style, which is so typical for Gozo farmhouses, but combining this with modern comfort. It comprises a total area of 350 m2 with a sitting room, large dining/living room with dining table and sofa, partly open kitchen and toilet/washing room at the ground floor. The kitchen has all amenities and the wash room contains a washing machine. Wide doors give easy access to a spacious garden with a 30-m2 pool, pool shower, barbecue, gazebo and garden furniture, overlooking the fields. We are licensed by the Maltese Tourist Authority (MTA). Hi , I am Dutch by nationality and married since 1982 to a Maltese lady. My profession has made us live for the last 25 + years in 8 different countries around the world and we recently decided to settle down in Portugal . Considering our strong family ties with Malta we always wanted to purchase some property on the sister island of Gozo. Why Gozo ? because it is much quieter and more intimate than Malta, also greener throughout the year with lovely beaches close by. We purchased this property at the time and had it converted because we loved the location being on the outskirts of Xaghra ,with green areas behind,the possibility to have a nice garden, quietness but nevertheless still with all amenities of Xaghra within walking distance (10-15 mins). The property has 12 solar panels installed , is fully self supporting on electricity and in addition exports around 2000 Kwh/year. In total it avoids around 4 T CO2/year. In all 3 bedrooms (inverter type). WiFi with reach throughout house and garden ! One at the front overlooking the fields and one at the back facing the street. Maid services are provided once a week. Attractive car rental can be arranged via housemanagement representative The garden is lighted and has a comfortable Gazebo where 4-6 people can dine. Wireless internet included in the price, with full plot coverage. We had a wonderful family holiday. The house was great, full of character and provided all we needed. The location is a perfect stroll from the square in Xaghra where you have several great restaurants and bars. We hired a car in Victoria for a good price which gave us the freedom to explore this small but fascinating and beautiful island. Nowhere was more than an 20 mins away and luckily for us the sun shone constantly for our late October holiday. Many thanks for your review and very pleased to hear that you enjoyed your time in Gozo ,the house and the town of Xaghra ! The Xaghra square has indeed over the last years transformed in a cosy place buzzing with activity from the few nice restaurants, bars and coffee shops. We hope to be able to welcome you back at Arzella in the future. Arzella is a gorgeous converted farmhouse in Xaghra. Our family of five loved our stay here, it felt very authentic and offered the chance to experience life as a local. The house is a short stroll through the quiet streets to the main square which offered a variety of restaurants and bars to dine in. The supermarket is a handful of meters down the road from the square, and certainly manageable on foot to stock the kitchen. We exclusively used public transport while staying in Xaghra and had no problems getting by bus to Victoria or the Mgarr Marina to catch a boat to the Blue Lagoon. The farmhouse was spacious and clean but we mostly enjoyed the garden, gazebo and pool which was the highlight for our children. Thank you for a wonderful stay. Hope to see you back in the future ! Great accommodation wih local Maltese character feeling - everything supplied for a short stay and wonderful pool area for relaxing and cooling off after a hot day of sight seeing. Many thanks for taking the trouble to provide us with a review and obviously pleased your group enjoyed their stay ! Hope to see you back at Arzella in the future.. This beautiful villa, which is situated near the heart of Xaghra, has been renovated to a high standard both inside and out. The kitchen, although somewhat basic, had everything we needed for a comfortable two week stay. The pool and garden area was very clean and well maintained. The only down fall was that the master bedroom was the only room that had aircon. Fans and ceiling fans are provided for each room but aircon would have made the stay more comfortable for my fellow guests at night. Frans was very friendly and helpful and answered any questions promptly. I would highly recommend this villa and will definitely be staying here again. Hi Steven, thanks for taking the trouble to review and pleased that you & family enjoyed your stay. I like to mention that this winter we will have AC's installed in the other two bedrooms as well . So that situation will be resolved ! Hope to see you back some time in the future ! The house was presented in a reasonable condition one the maid had been back to wash the plates / glasses. However a number of things should be noted if anyone wants to rent this. 1. It has no dishwasher. This is a real pain on a self catering holiday. Appreciate it was not advertised with one but it is easily overlooked especially given the price. 2. A/c. There is only one unit in the house which is not enough especially in the summer. Fortunately some more fans were provided. 3. The garden and pool are a) small and b) overlooked. There is no view except of the backs of other people’s houses and some goat sheds at the bottom of the garden. 4. The location is fine - it is a backstreet some 10 mins walk to the main square but it is remote. A car is needed to get anywhere especially as the local Xaghra supermarket is poor and overpriced. Not sure the house is priced right. Premium price but average for all other things. Many thanks for taking the time and trouble to provide us with a review of your stay. It seems that the house didn´t completely live up to your expectations. Partly I believe it is because you might not have had the opportunity to read in detail through the description of the property at the time of booking ? There it mentions that the master bedroom has AC ,but the other rooms rely on standing and ceiling fans. Also there is no mention of a dishwasher.…. Nevertheless we have now had a few guests suggesting to install AC´s in the other two bedrooms as well , so we will have these installed. By the same token we will look into installing a dishwasher. Your comment that the garden/pool is overlooked is correct as our neighbours can see our pool /garden ,like we can see theirs from our master bedroom. The photos on the website also clearly show this. The good thing is that the property isn´t lived in , apart from the occasional holiday booking. Your remark about small pool and garden I believe is also a matter of managing expectations. The pool is 7 x 4 m which is an average size for the properties in Malta and the garden measures around 110 M2, which is quite large for Malta/Gozo standards. Actually as you surely noticed the islands are struggling with space and having a garden is already quite a privilege, let alone one of over 100 m2. As a matter of fact the garden is often mentioned as one of the highlights of the house by our guests. Lastly as regards pricing of the property with modern search tools it can be relatively easily concluded that the pricing is conform the market for the type & size of the property. Summarizing it appears that the property didn´t fully meet your expectations ,most likely because you didn´t have or took the opportunity to orientate yourself sufficiently at the time of booking. You then did ask us about diving and restaurants and later about extending your stay & payment methods, pity it never came to questions about the property itself ! Lovely old building beautifully renovated. Three minute walk from the town square. Large bedrooms and very clean. Only downsides were the lack of soap and the tendency to run out of hot water (we were four people). Great value for money though. Dear Anne, many thanks for taking the trouble to write a review on your "Arzella" stay. Obviously please that you enjoyed it ! Regarding your points for improvement : we are working on installing soap dispensers as we had other guests mentioning it as well. With respect to warm water , yes with four people and relatively low supply water temperatures the heater might need more time to warm up. Also the temperature has been adjusted a bit lower , to avoid smaller children getting burned. We will install a new heater before next season with a possibility for the guests to adjust warm water temperature, if desired. 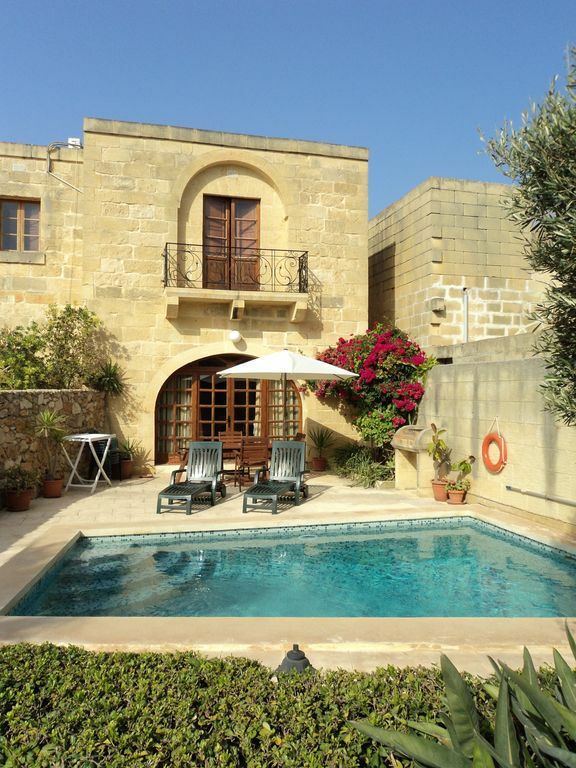 Why not spent your holiday in a converted 150 yr. old farmhouse in the mid of the Mediterranean Sea on the sunny, quiet and picturesque island of Gozo with its more than 3000 yr. of history? Farmhouse Arzella ('Shell') is a beautifully converted 150-year-old farmhouse with a spacious garden at the border of the picturesque and quiet town of Xaghra (pronounce: shara).